I ordered a 56 this morning and had a phone call this afternoon saying it will be delivered on Monday. 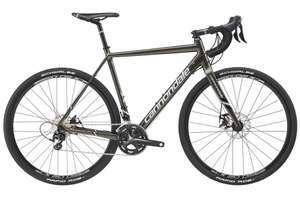 Cannondale CAADX 2017 105 Groupset, only 58s left. Use the code BLACK10 for 10% off. I own a 2016 CAADX and it really is an extremely good bike, fast on the road and very fast off-road. The next nearest price I can find is Evans at £1049. There shop is in Newcastle but they deliver the bike in the UK for free. Serious do-it-all versatility meets serious ‘cross racing capability. With a lightweight, smooth-riding frame and the same traction, fit and handling as the new SuperX, CAADX is the ultimate “race on Sunday, commute on Monday” all-around adventure machine. Please call for availability of other sizes. Redesigned Speed Save Micro-Suspension: Dramatically shaped and flattened seat stays and chainstays absorb shock for better control, traction and comfort. Flat Mount Rear Brake: Low profile, easy to adjust and superlight flat disc mount in the rear. Removable Seat Stay Fender Mount : Secure mount for fenders. There when you need it, gone when you don’t. Included with bike. Tapered Steerer: 1-1/8" to 1-1/4" tapered steerer and headtube provide the ideal blend of stout steering precision and light weight. Really good bike for the money, and this 2017 model looks a lot nicer without having ''Cannondale'' plastered over every inch of it. I honestly prefer the 2016 Black/White colours but prefer the internal cabling, better frame and better forks on the 2017. There normal price is £879 which is still a bargain. I phoned up yesterday about a 56 and they said it was in stock. Today I checked the site and see the 10% off code and thought I would try it and it worked a treat. Insaine value, They sell in eBay second hand for more then this. I should get a good £600 for my year old CAADX 105. Just to add the only let down on the 2017 105 is the 11/28t and not a 11/32t but its easy to upgrade. Looks really nice good spot!